VAN NUYS, Calif., Oct. 22, 2018 (GLOBE NEWSWIRE) -- Capstone Turbine Corporation (www.capstoneturbine.com) (Nasdaq: CPST), the world’s leading clean technology manufacturer of microturbine energy systems, announced today it continues to expand into the Permian Basin with another 1.6 megawatts (MW) of long-term microturbine rentals on top of the initial 2.0 MWs rented just a week earlier. All 3.6 MWs are being rented by one of the world’s largest oil and gas producers. Both long-term rentals were secured by Capstone’s new distribution partner, Lone Star Power Solutions. The first two units were delivered and are in the process of being commissioned, while the next two C800 microturbines are expected to be delivered and commissioned in November. The Permian Basin is widely considered one of the most abundant oil and natural gas regions in the United States and reportedly holds a number of large crude oil fields including more than 20 of the nation’s top 100 oil fields. Capstone is focused on securing additional long term rentals in the Permian Basin to drive market awareness and the company’s target of sustained double digit growth. 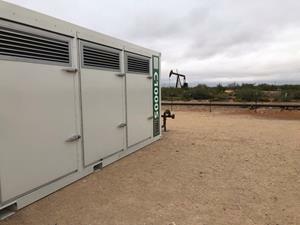 “These long-term 3.6 MW microturbine rentals are a significant opportunity for us as this is our first transaction with this major oil and gas company in the Permian,” said Darren Jamison, Capstone’s President and Chief Executive Officer. “Rentals are key as the recurring revenue stream they generate will improve our expense absorption and gross margin, and help us reach our profitability goals,” concluded Mr. Jamison. The oil and gas company sought a flexible and scalable energy solution that could be quickly and easily deployed within 45 days and increase power capacity and accommodate the growing energy needs of its installations. Capstone microturbines are reliable, modular, inherently redundant by design and can be easily expanded or relocated to accommodate changes in customer’s future site loads. Natural gas generators are gaining popularity in the rental market due to their lower emission profile compared to the high environmental impact of diesel rental generators. Capstone microturbines are recognized as the low emission leader in the stationary power space. “It is great to see yet another win for one of our newest distribution partners as they capitalize on the flexibility of our C1000 Signature Series product,” said Jim Crouse, Capstone’s Executive Vice President of Sales and Marketing. “With today’s high oil prices, we continue to see expanding opportunities in the North American energy market as customer activity picks up and they continue to find value in our compact, quiet, and reliable microturbines,” added Mr. Crouse.